You probably haven’t heard of the underground ruins beneath this 16th-century palazzo in the heart of Rome. But you should. Not only are they of two opulent Imperial-era villas, still with their gorgeous inlaid marble floors and mosaics, but they’ve been presented in a way you don’t see anywhere else in Rome. As you walk through them, they’re actually recreated before your very eyes, thanks to skillfully-done light shows. It’s like what Rome does to the Ara Pacis to make it come alive, except with entire ancient homes. It’s all very 21st-century. Very not-what-you’d-expect-in-Rome. And very, very cool. To be completely honest, it blew me away… so much so that, since the exhibition/show/ruin/whatever-you’d-call-it opened last fall, I’ve been three times. The way you experience these ruins is unlike any other site in Rome. With the dozen or so other people in your group, you descend down the stairs (truly vertigo-inducing, since the modern stairs are simply glass laid over ancient stairs)… and into the private bath complex belonging to the first villa. As the (very well-done) automated English tour begins over the speakers, pointing out where the pool was, the furnace, the heating system, different parts of the room are lit up to not only guide your eyes, but help “recreate” what the area would have been like. The visit to the villas continues. Although “visit” or “tour” makes it sound far too dry. If anything, Palazzo Valentini is more like a time machine. A Disneyfied one, to be sure, from the light displays to dramatic music to automated audio, but one that really gets it right. Along the way, there are some real surprises thrown in, from the Renaissance-era pottery that was found in excavations (turns out, the ruins were used as an after-dinner dumpster), to the mystery of an enormous room that was found with a shattered marble floor (now put painstakingly back together) and burn marks. (Of course, archaeologists have figured out why this is… but you’ll just have to go to Palazzo Valentini to find out!). Another bonus is the multimedia presentation that shows you what both the Palazzo Valentini area, and the center of Rome, would have looked like 1,800 years ago. Between that, the glimpses of how archaeology works (like a quick explanation of stratigraphy), and the just-super-neatness of those darn light displays, Palazzo Valentini is a perfect stop not just for ancient history and archaeology buffs, but, even more so, for those who haven’t studied ancient Rome in depth and don’t quite understand how it all looks (or why it’s cool to begin with). So please. Go to Palazzo Valentini. Palazzo Valentini is located at Via IV Novembre 119/A, right next to Piazza Venezia and Trajan’s Column, and just a 10-minute walk from the forum and Colosseum. You now can book online; just make sure you pick an English (“inglese”) tour! 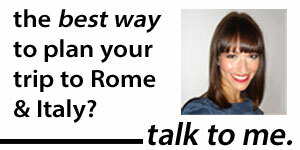 You also can stop by once you’re in Rome to make an appointment for the next English tour, or call +39 0632810. (There are always security guards outside the palazzo because it’s the Provincia’s headquarters; just tell them you’re there for the exhibit). Tickets cost 6 euros full-price, 4 euros reduced (including 6 to 25-year-olds and those over 65; you don’t have to be an E.U. resident to be eligible), plus a 1.50 booking fee. It should cost the same online, over the phone or in person. Also: 11 etiquette mistakes not to make eating in Italy, Nero’s Domus Aurea reopens to the public and three top sites you must book in advance. Tours are either in English or Italian… when booking , I requested tour in English but upon arrival for actual tour, was advised that my tour was in Italian. So…. when booking, be SURE,,, that you book your preferred language tour…. However, much of the tour is understandable… via audio/visual and thus is understandable… without translation.. Thank you very much for pointing Valentini out ( and other places mentioned on your website ) . I never would have found Valentini otherwise.. Great website ! Hi G. Gunter, thanks so much for sharing your experience with us! Triple-checking that your tour will be in English is good advice, and in fact, when I did a tour with my English-speaking grandparents in March, the same thing happened to us. So thanks for pointing it out. Hopefully, as more and more English speakers become aware of Palazzo Valentini and book it, this will become less of a problem. I’m so glad you’ve found the website helpful, and I hope you enjoyed Rome! Thanks for the tips. I am curious how long the tours are/how much time to give myself here and at Domus Aurea and San Nicolo? Thanks! Hey Catherine, apologies for the late response! The Domus Aurea is about an hour and a half; San Nicola in Carcere is self-led, so it’s up to you, but you can see the whole underground there in about 15 minutes (it’s a fairly small space). I hope that helps!